Gum disease affects approximately half of all Americans. While that’s a startling statistic, what’s more notable is that most cases are preventable. The good news is that preventative care is simple and, by taking care of your smile daily, you can ensure you don’t become part of the statistic above. When teeth aren’t kept clean, bacteria starts to grow in the mouth. Bacteria can cause inflammation and, over time, lead to the development of gum disease. Gum disease doesn’t usually cause pain or discomfort as it begins to develop, making it more difficult to recognize at first. Brush for at Least 2 Minutes Twice Daily — Brush with fluoridated toothpaste in the morning and in the evening. Take special care along the gum line to remove any food and bacteria. If you have trouble keeping track of time, you may want to invest an electronic toothbrush with a built-in timer. Floss at Least Once Daily — Floss removes food and bacteria that brushing can’t, preventing the formation of plaque and related gum health issues. If you struggle with traditional floss, you may opt for an interdental cleaner or water pic. Use a Mouthwash — Mouthwash, in combination with brushing and flossing, helps to reduce plaque buildup, thereby preventing gum irritation. Eat a Healthy Diet — Avoiding starchy and sugary foods helps to decrease plaque and the potential for gum disease. Professional Cleanings — Only dentists have the tools necessary to remove plaque from your teeth, making it important to get professional cleanings every 6 months. 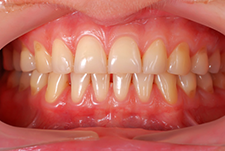 If you suffer from gum disease, you should try to visit your dentist more frequently, every 3-4 months for cleanings. Common Dental Problem Correction — Improper fillings, grinding, and other common dental issues can increase the risk of gum disease. Proactively correcting problems like these will decrease the risk of gum disease. Only you can provide the day-to-day care your teeth and gums deserve. However, there is only so much you can do on your own and, therefore, you should visit your dentist regularly as well. You don’t have to be one of the many Americans currently suffering from gum disease. By taking steps to understand, recognize, and prevent gum disease, you can enjoy a healthy smile, gums included!